The weekend of the 1st and 2nd of February saw 38 Teams kick off the 2014 Vic Bream Classic Series by heading to Docklands to battle it out amongst Melbourne's concrete jungle for the Atomic BIA Bream Classic. With weather conditions looking great for both days fishing all eyes turned to the favourites for the tournament and whether they'd stay in the local rivers or head far and wide to chase bream in the many locations around Port Phillip Bay that they reside. For 2014 champions Team Berkley no one was surprised that they headed to the Werribee River or that they took victory, but more interested in how they did it yet again. 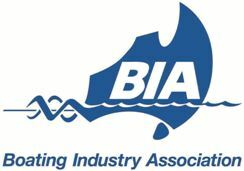 Anglers awake to perfect conditions on Day 1 with no wind and a heavy fog keeping the sun at bay offering more time to target bream away from the line destroying structure around the Melbourne docks and harbours. For Team Berkley yet again it was a run to the Werribee River that they know so well. "With the loan of Bill Classon's 22ft Blue Wave boat, we made our way across the Port Phillip Bay from Williamstown to fish in the Werribee River. With such a long distance to travel and a 5knot speed restriction in the rivers we effectively gave ourselves just less than 4 hours to catch the fish" Brad said. "Our plan for Day 1 was to fish the shallow edges using the Berkley 3B Puppydog in pointer, mongrel and electrofry colours. The presentation of the lure was all important. We were casting our lures right up into the shallows and used a high rod tip to impart a rip and pause action, this presentation enticed many strikes whereas other retrieve patterns failed to attract any interest at all. We landed fish regularly throughout the morning but as the tide dropped the bites became harder to come by. During the low tide change it was important to cast as far away from the boat as possible and the incredible thinness of the 4lb nanofil helped us achieve this. With 8 legal fish boated for the day this enabled us to upgrade our limit a couple of times before making the long trip back to the weigh in" Brad said. With many teams struggling to find quality fish the boys from Team Berkley were sure to be up the leader board after the day one weigh in and with 5/5 bream for 3.58kg these was no doubt they'd be up there but they couldn't take out first place after day 1 as Team Evolution boats Ben Scullin and Daniel Brady weighed in a cracking bag of 5/5 bream for 3.70kg which to everyone's surprise they landed from the mouth of the Little River which handed them the lead on day 1 and also secure them the Maria Lures Best Bag for the weekend. Also hiding in their day 1 bag was a solid 1.14kg bream that handed them the Eco-Gear Big Bream for the weekend. If Team Evolution Boats could hold on and take out Day 2 they would scoop all the prizes for the entire tournament, but with ever consistent Team Berkley hot on their heels it was always going to be tough. Heading into Day 2 saw super calm and bright conditions for anglers which was going to make it just that little bit tougher to entice and not spook the ever weary black bream. For Team Berkley it was off again to focus on the Werribee River and see if another 5 quality fish could come to the net. Armed with 3-5kg Abu Garcia Vanguard rods matched to Abu Garcia Revo Premier Spin 20 reels filled with 4lb nanofil line and a 3lb sensi fluorocarbon leader, Team Berkley started their charge to victory. "For Day 2 we had the same plan however the super-hot and calm conditions made the fish really easy to spook. It was slow going but by employing the same lure presentation technique as Day-1, we eventually landed our 5th fish around 10:30am. Again we used 3B puppy dogs which are a silent lure and I believe this was a huge advantage which helped us tempt the spooky bream. The catch rate remained very slow and it was about 12:30pm, just before we needed to leave the system to make the long trip back to the weigh in, that Mike landed an important upgrade" Brad said. What an important upgrade it turned out to be as with Team Evolution Boats only managing 5/5 for 3.04kg it opened the door for Team Berkley to sneak home and when they weighed in 5/5 bream for 3.25kg giving them a total of 10/10 bream for 6.83kg it was enough to pass Team Evolutions boats and be crowned the 2014 Atomic BIA Bream Classic Champions. Rnd 2 will see the series move from the city to the country as we head down to Mallacoota for the Engel East Gippsland Bream Classic. 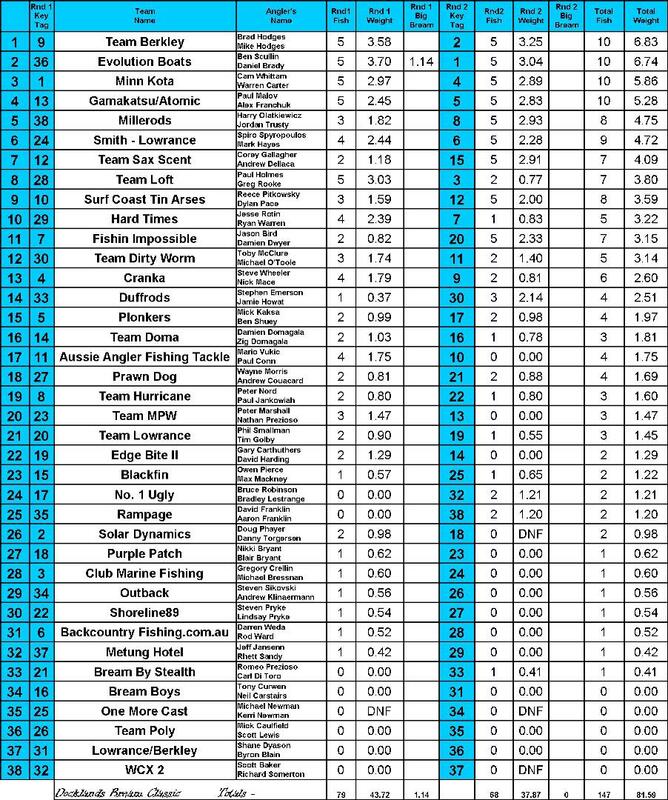 For all the details on the 2014 Vic Bream Classic Series log onto www.vicbreamclassics.com.au or find us a facebook under Vic Bream Classics and that way you can keep up to date with all the scores, pictures and videos from the series as they happen.